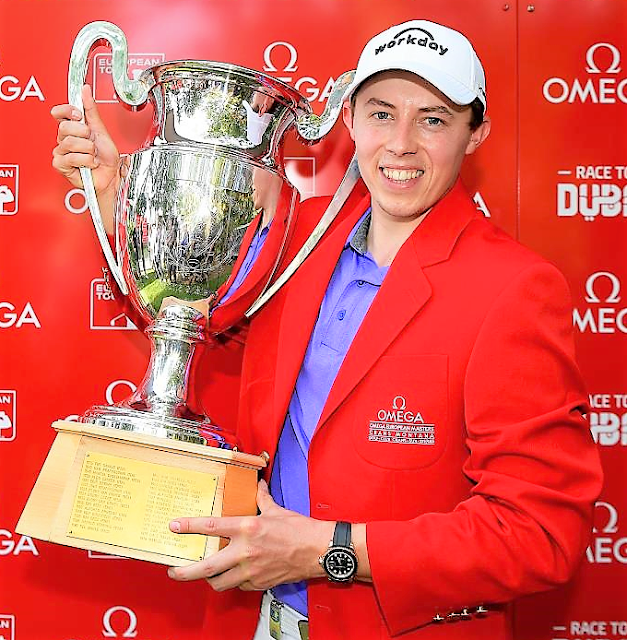 Matthew Fitzpatrick, pictured by courtesy of Getty Images, beat Lucas Bjerregaard in a play-off to become the first man in 40 years to successfully defend the title at the Omega European Masters. The Englishman started the day four shots ahead of Bjerregaard but the Dane carded a brilliant 63 to set the target at 17 under and Fitzpatrick had to birdie the last to take it to extra holes. The 24 year old then put his approach to 12 feet on the first trip back up the 18th and another birdie saw him become the first player since the late, great Seve Ballesteros to go back-to-back at Crans-sur-Sierre Golf Club. The final day had developed into an enthralling three-way battle between Fitzpatrick, Bjerregaard and Mike Lorenzo-Vera, with the Frenchman right in it until he bogeyed the last after finding the water. Lorenzo-Vera finished at 15 under, three shots clear of Spaniard Nacho Elvira and four ahead of England's Daniel Brooks. Fitzpatrick needed extra holes to beat Scott Hend in the mountains last season and became just the third player this term to mount a successful defence after Tommy Fleetwood and Brooks Koepka. At 24 years and eight days old, he also becomes the youngest Englishman to get to five European Tour victories, having won in every season since coming through the Qualifying School in 2014. For Portugal Masters champion Bjerregaard, the result is a third consecutive top ten, while Lorenzo-Vera has three top tens this season as he looks for a maiden victory. Japan's Hideto Tanihara and Chinese Wu Ashun were at ten under, a shot clear of South African pair Darren Fichardt and Charl Schwartzel, American Doug Ghim and Thai Phachara Khongwatmai. Frenchman Adrien Saddier made the 32nd hole-in-one of the season and second of the week when he holed a seven iron from 192 yards on the 13th. Matt Fitzpatrick: "That was tough, that was really tough. Of all my wins I'd say that was definitely the most difficult. I didn't have my A game today, despite loving this place I just didn't play my best today. I managed to grind it out, made some crucial birdies coming in and I'm delighted. This is one of my best. "The up-and-down on seven was key. After just making bogey on six, which is kind of my favourite hole, making birdie there got me back on track and within touching distance. I just managed to grind it out, didn't make any sloppy mistakes coming in and managed to finish with a few birdies. "Last time was a lot different, I felt like I was playing okay but it was just make par, make par, make par. For whatever reason this year, a change of attitude, I definitely feel like I'm playing way better right now than I was this time last year. Me and Alistair agreed, 'just go out and try and win it, don't hope that the other guy doesn't play too well'. That's what we did and I can't say how happy I am that it paid off. "This is what I wanted to achieve this season - another win. To get it here again is so special and to get my fifth is amazing. I love this place." Lucas Bjerregaard: "I played really well today and I got the start we talked about yesterday, five under on the front nine put a little bit of pressure on the guys. It's hard right now, I would have loved to get that win but it's been a great week and you can't argue with two birdies from Matt on 18. Congrats to him. "I've played well here the last couple of years and it's really good week, a lot of positives. It hurts right now but I'm sure after a glass of red wine tonight it'll feel a lot better. "I needed a fast start, he was a good bit in front of me. I needed to come out and put some pressure on and I did that - birdie on the first and birdie on five. "It would have been nice to get it this week but it feels like it's close, the game has been good with three straight top tens so I'm pretty pleased with that." Mike Lorenzo-Vera: “It was maybe a bad decision to go there on 14. I had the lie, I wasn't sure about the distance and then it came out like a rocket and just ended up in the trees behind. I think I pushed it a bit too hard at the end, that three-putt on 14 was just trying too hard to keep the lead. “It's a good experience here. To stay in contention twice in the year, I think I've never done that before so that's on its way. “I got out of the game-plan and then I paid. At this level you cannot get out of the game-plan. “I made a lot of birdies so that means that the work on the greens has been really good. I'm much better off the tee compared to last year so it's good. The work is going to pay rewards.